It's time for a new Flourishes Timeless Tuesday Challenge ~ FTTC172!!! Amanda is our hostess and she has challenged us to use *CREATE A WHITE CARD* OR *A PROJECT WITH LACE AND/OR PEARLS*. I decided to create a card with Lace and Pearls :) !!! I couldn't resist inking up the super sweet Hello Baby Set. The image was inked onto Flourishes Classic White CS with Memento Tuxedo Black and colored with these Copic Markers ~ R12, R35, YR02, B02, BG10, YG11, G21, E25, E55, Y15 plus Colorless Blender. Next I added some DP from the My Minds' Eye Howdy Doodle Collection, some White Lace, Peppermint Twine & a matching Button, White Kaiser Pearls and some Prima Flowers. Now it's time to swing by the rest of the team ~ Cindy, Maki, Heather, Mona, Beate, Amanda and please help us welcome our brand new June Guest Designer Alice Wertz. For all the important details please stop by the Flourishes Blog. As always thank you for taking the time to stop by! I'll be back in a little while with my Color Q card...see ya then :) !!! Adorable card with wonderful coloring. Love the lace & roses, too. Such a sweet card Silke! Love the sweet baby themed scene and all those pearls! So sweet and lovely Silke. Beautiful these card. What a beauty! I love the colors and the nest and little bird in the tree. Of course the pearls and roses are wonderful as well! 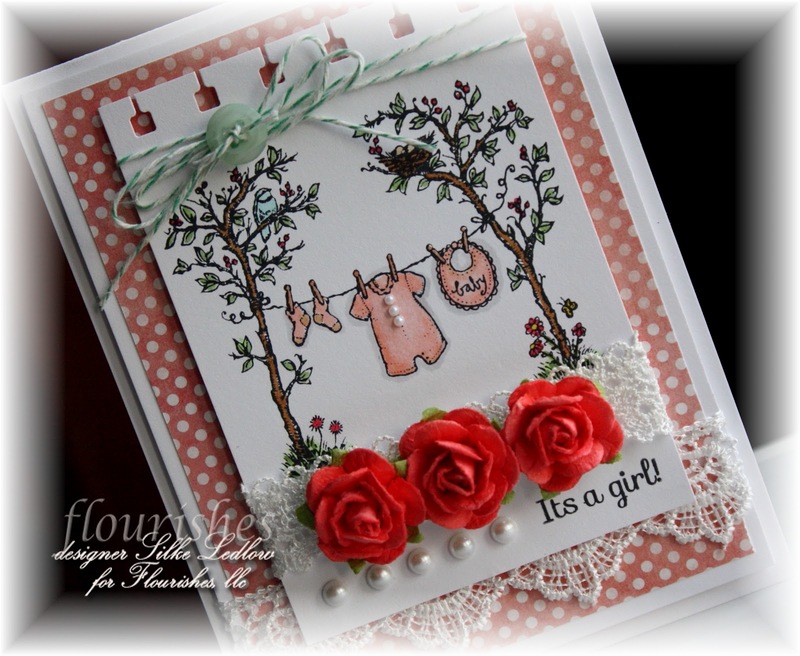 What a darling baby card. I love it! 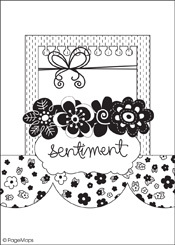 Your card is perfect for this sketch and love what you came up with! Adorable and gorgeous Silke, I love your cards! Hi Silke, what a darling card! I love the trees and the double lace is just gorgeous. Hope you're doing well. 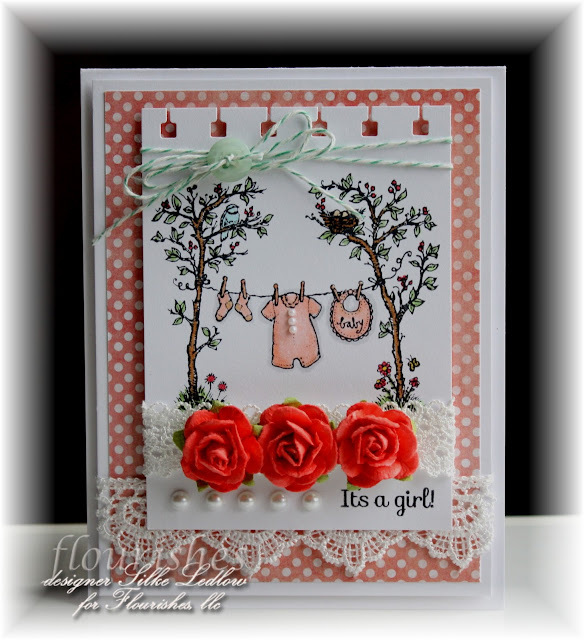 What a Gorgeous baby card!! I love the sweet colours and the pretty laces and pearls. Fabulous design, Silke!! awww... this is so sweet, Silke. that pearls on the onesie is such a cute touch! love your darling card! Such a cute card!!! I have this set - just need to get it inky!!! Such a gorgeous baby card... so beautifully coloured and embellished. Oh, your card is so cute, Silke! Love this stamp! Your roses are also so beautiful!